Chuck Wicks is back with brand new music. The Nashville recording artist’s highly anticipated “Rough” EP released April 9, 2013 at iTunes, offering the 5-song EP for $2.99. And autographed copies are available at Chuck’s Place. At release time, “Rough” was at #11 on the iTunes chart, #22 on the All Genre Chart…and climbing! Now, Wicks might’ve Stolen Cinderella back in 2007. But this country hunk with the seductive voice, intoxicating eyes and charismatic smile is back – and he’s gonna steal more than Cinderella with five intensity-building tracks leading to a “Rough” desire (um, I don’t think there’s a pun intended, hm, you decide). “Rough” spotlights original music all co-written by Wicks including the new summer single “Salt Life,” which he penned with Mike Mobley and Vicky McGehee. In celebration of the release, over 20,000 Wicks’ fans will receive a complimentary copy of the EP through select Salt Life retailers with their purchase of Salt Life branded products. And definitely drop in at Salt Life and check things out. It’s an interesting and highly sought after way of life we all wish we could live. The “Rough” Tracks . . .
“Rough” starts off very smooth – seriously, no cliche. The album opens with a head-turning guitar riff playing parallel to Chuck’s silky vocals lavishing all over you as intensity builds musically, vocally and lyrically, pleading his love interest to “Fix Me”. Seriously, fix Wicks? Somebody’s gotta fix me. I fluttered and fell weak in the knees with this sumptuously rich request. This is proof in the pudding that music immediately affects its listener. Okay. My cardiologist has given me the green light to continue listening. Whew! “The Whole Damn Thing” is a snappy tune leading up to an awwww shucks twist in the chorus, closing where we all wanna be – ah-ah! no spoiler. “feeling kinda crazy I’m just chillin’ with my baby // on a Saturday afternoon // man I’m thinkin maybe that I finally found my lady // and I think she feels the same way too”. I’m not sure what actually happened listening to “Always” but it gets you from every angle. My, Oh My! Chuck’s deep but creamy vocals grab your attention here (and probably your heart) and leave you immediately succumbing to a magnificently brilliant vocal range serenading a confession. Spent! would best describe this seductive track. “Salt Life”, “Rough’s” upcoming summer single release, is everything you might think and then some. This Margaritaville-vibe sends out waves of invitation to get high on the good life (no-spoiler here! you’ll have to get your copy of “Rough” to find out what that means) but I’m not convinced that Chuck’s not intensifying this euphoric high. All Told . . .
Chuck Wicks has definitely grown in many ways. Not only is this EP mezmerizing musically and lyrically, you’ve got a bona fide “Male Vocalist” here that the industry’s a fool if they don’t recognize. “Rough” is sumptuously rich, dripping with vocal opium. Go get high!! 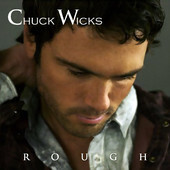 FREE Chuck Wicks “Rough” EP Release Party TODAY April 11, 2013 – Not to be Missed!